I have had this dress sitting around for a little over a year waiting for a new life! I had my mom bargain with a lady for me at a swap meet, cause she would have none of it when I tried! I think my mom got her down to $25, so I took it home happy! The sleeves were completely torn out of both armholes and there’s a big stain down the front, but you don’t really see it when the skirt is laying in folds. The dress is also somewhat dry, but I really wanted it especially for the lovely beading! It makes me happy daydreaming of the previous life it had. My favorite daydreams consist of a romantic evening on an ocean liner on a transatlantic voyage, or a dance at the Casino at Avalon Ballroom in Catalina, where she probably promenaded with her beau to the sound of the waves. Whatever the past, it is a lovely dress. I imagine it was for dancing, but even with my piecing back the armholes, I’m afraid I can’t lift my arms very high, unless I were to make inserts nearly all the way around the armhole, which would ruin the line of the dress. 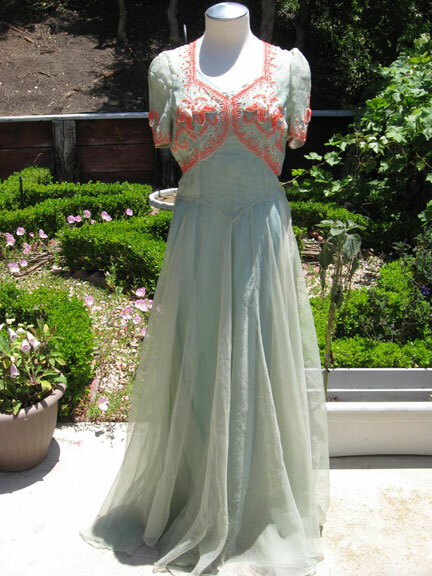 Still, $25 for a lovely dinner frock which would be quite at home on the Queen Mary isn’t a bad investment! Here she is, all mended and pressed and ready for her new adventure, and the slip I was given as a gift from a lady on the Fedora Lounge makes a near perfect color match! >Looking good! 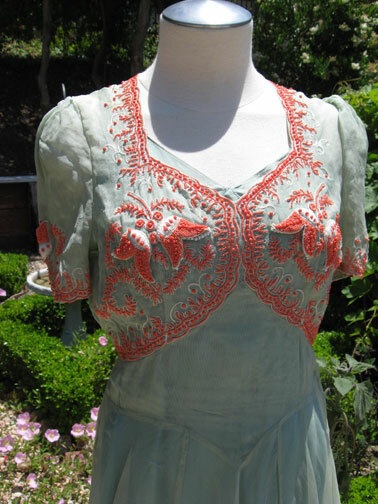 The color seems to be more washed out in the photos because of the bright sun, but that dress is super pretty. You should keep an eye out for some coral costume jewelry. 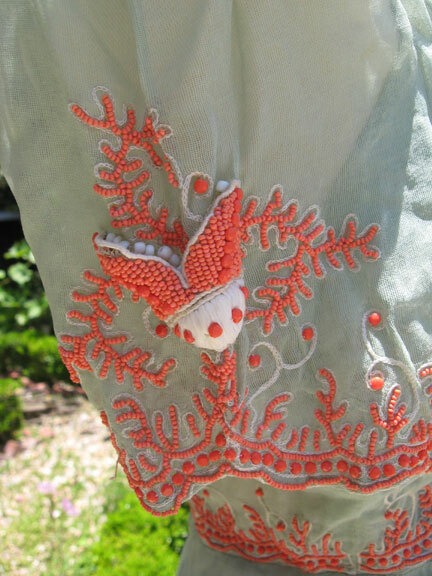 I used to have a string of coral beads that I was given as a child, but I think they were lost sometime during one of my college moves or I’d send them down to you to wear with that lovely gown!Would a good steaming help the dryness a bit? >Oh my! This is stunning! 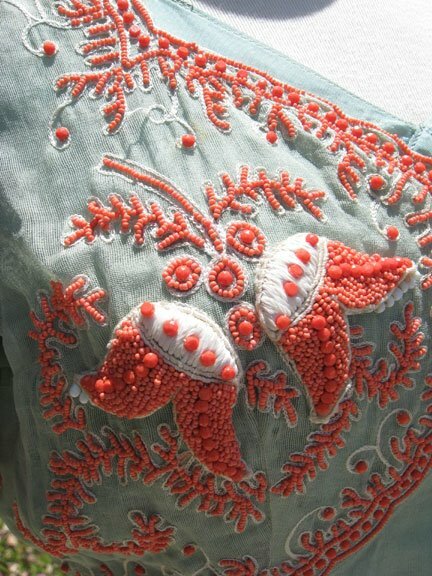 What a treasure to find… The beading is just truly magnificent. 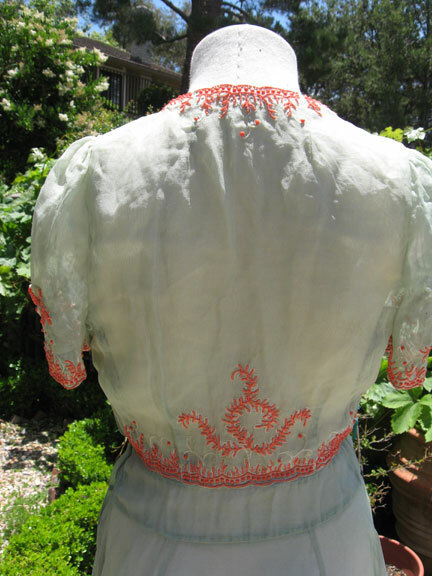 I find it so amazing that something with beads all over the delicate fabric is still so intact (since so many times dresses like these are in shreds!). Gorgeous! >Oh my god. That's all I can say. >Awesome design!! I just love this beautiful dress!! Thanks for sharing! !